Farming equipment doesn't get any cheaper than rope. 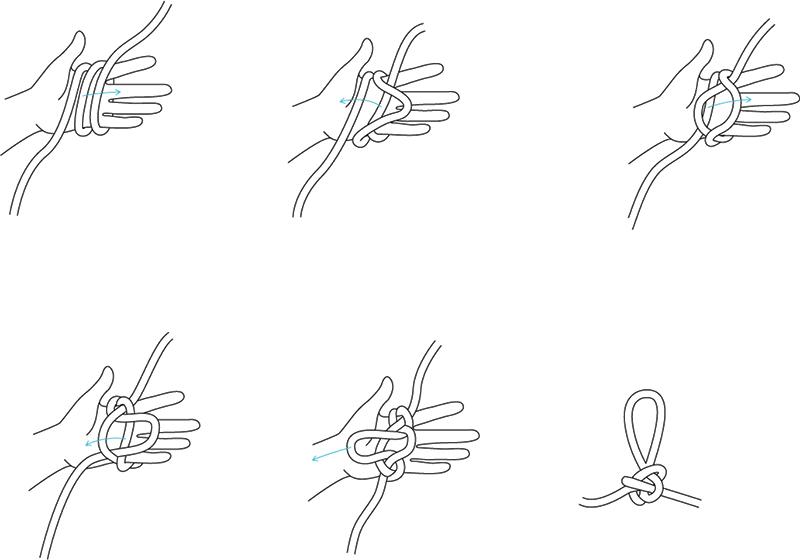 Here's four simple knots you can use in hundreds of different ways. The running end is the end you manipulate. The standing end is the part you don’t manipulate. The bight is the curve between the running end and the standing end. Different jobs call for different materials and thicknesses. Polypropylene rope, for example, can safely pull twice as much weight as Manila rope made from hemp of the same thickness, but its slipperiness makes it difficult to keep a knot in place on a slack line. 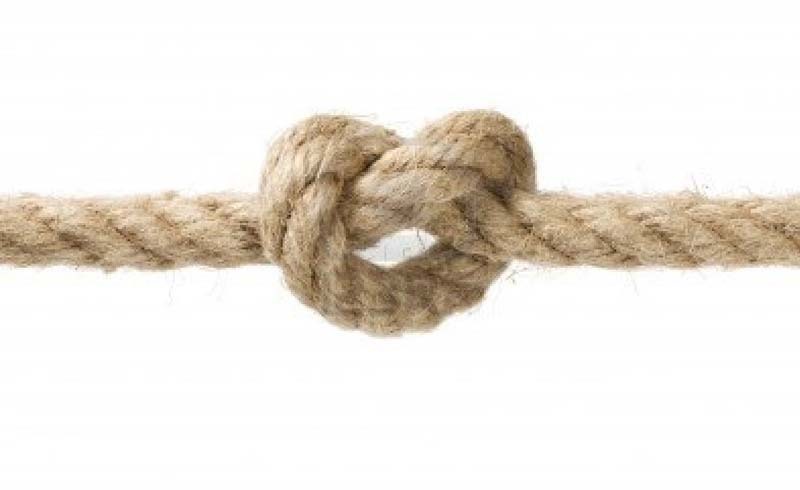 This easy knot makes a loop that can serve as a handhold or place to attach tools and other objects. You can also tie farmer’s loops to take up slack in a line of any weight. Start by wrapping the rope around your palm three times, letting the ends hang. Next, lift the middle loop over the right loop (which becomes the middle). In the same manner, pull the new middle loop over the left loop and then pull the new new middle loop over the right loop. Holding the top of the loop that’s now in the middle, slip the rope from your hand and tighten the knot. You can close a half-empty bag of feed by bunching the bag’s top into a neck and fastening it with a miller’s loop. Going right end (running end) over left, wrap the rope around the neck. Then circle the neck once more with the running end. Slip the running end under the coils (loosening them first, if necessary), and pull both rope ends to tighten the knot. This one is used for tethering an animal to a rail by a rope attached to a halter. Drape the rope’s running end over the rail, and then pass the running end over the standing end to form the main loop. Pass the running end behind the main loop, which creates a second loop. Bend the rope into a bight near the running end, and pass the bight over the main loop and through the second loop. Tighten the knot by pulling on the bight and the standing end. A halter hitch is quickly untied with a tug on the running end – convenient for farmers but also easy for clever animals. You can lock the knot by inserting the running end into the bight. The bowline is the go-to knot for rescuing people from holes or ledges. It is also tough enough to hoist an injured animal or pull a truck out of a ditch. 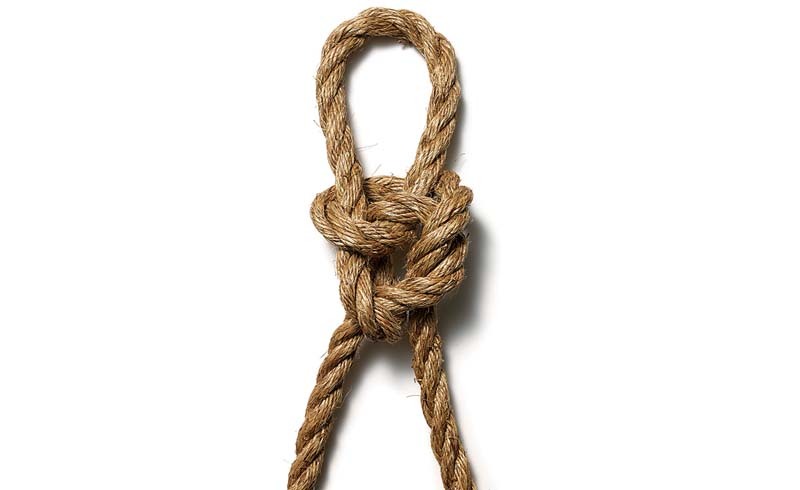 This knot gives the rope an end loop of whatever size you want. To tie a bowline, make a small loop far enough from the running end to allow enough rope for the desired end-loop size. Pass the running end through the small loop and behind the standing part, then back again through the small loop. Tighten the knot by pulling the end loop while holding the standing end.